Over every college break, I go home and I eat a lot. It’s no secret that I love to cook and upon arriving in a large kitchen, I can’t help but meet the granite countertop with a smile. Nonetheless, I’ve got some steady competition in the kitchen at home: my mother and father. I guess I didn’t have to spell out that my two older brothers don’t frequent meal-making times because those of you who know them, well you already knew that. I’m lucky enough to go to a college that still fits an Easter break into their academic calendar. This past Easter break, my first meal home was Clams and Linguine. As my brother Jake’s favorite meal, it’s a no-brainer that this dish is a family staple in the O’Donnell household. It was definitely a part of the rotation—hamburgers, pork and saurkraut, sausages and peppers—that made up my dinners growing up. 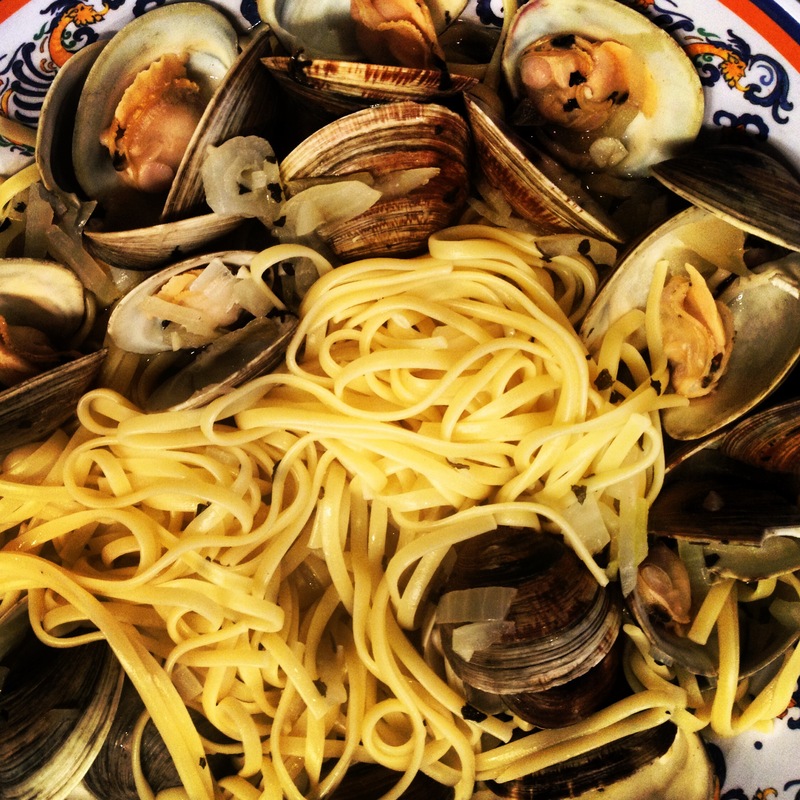 As seafood lovers, pasta fans, and Italians at food-heart, Clams and Linguine is a perfect fit for the O’Donnell’s. Both easy to make and beautiful to serve, we pull our Clams and Linguine recipe from The Silver Palate Cookbook. We typically use littleneck clams and at times disregard the bottled clam juice. The clam juice you buy in the store can hold a lot of unnecessary sodium so to replace, we will use white wine and olive oil as our base. To take the recipe up a notch, you can buy homemade linguine to anchor your clams in. Our favorite place to buy the pasta? Vace’s in Washington, D.C. Intertwined in a pool of linguine, the clams are abundantly spread within, beneath, and above the pasta. The meal transforms from a simple seafood dish to a full-on Italian meal with garlic, oregano, parsley, and plenty olive-oil to flavor. I couldn’t recommend an effortless course tastier than this, so make sure you jot the recipe down! 1. Heat the olive oil in a deep heavy pot over low heat. Add the garlic and cook until golden, about 5 minutes. 2. Combine the reserved clam liquor and enough bottled clam juice to make 3 cups. Add this to the pot along with the parsley, oregano, and salt and pepper. Simmer, partially covered, for 10 minutes. The sauce may be prepared ahead to this point. 3. Meanhwile, scrub the garnishing clams, if you are using them, and put them in another pan with water to a depth of 1 inch. Cover, and set the pan over high heat. Shake the pan or stir the clams and remove them as they open. Reserve them in their shells. Discard any clams that don’t open. 4. Bring 4 quarts salted water to a boil in a large pot. Drop in the linguine and cook until tender but still firm. 5. Meanwhile, reheat the sauce if you have allowed it to cool. Add the chopped clams and heat gently; clams should not overcook or they will become tough. 6. Drain the linguine and toss it with the sauce. Serve it in the pot, topped by the clam garnish, or transfer to individual wide soup bowls and garnish each serving with the clams in their shells. Recipe taken from The Silver Palate Cookbook: http://books.google.com/books?id=pokLqCAZFh0C&pg=PA91&lpg=PA91&dq=linguine+with+white+clam+sauce+silver+palate&source=bl&ots=gziX–Z8sE&sig=ZWpeREXd34X3udDyiN7oIPYfUYo&hl=en&sa=X&ei=LgJfU4PUMZHLsQSJyoCgDA&ved=0CEEQ6AEwAw#v=onepage&q=linguine%20with%20white%20clam%20sauce%20silver%20palate&f=false.